Candidates applying for APVVP Exam for Medical Department Posts must not exceed the upper age of 41 years as reckoned on 01-07-2018. For SC, ST, BC candidates 5 years, Ex Serviceman 3 years and for PH candidates 10 years of upper age relaxation is given. Assistant Professor: Must be a Post-Graduate in the concerned discipline from a recognized University/Institution. from a University duly recognized by MCI. Dental Assistant Surgeon: Must have secured BDS/MDS degree from a University duly recognized by DCI. General/OBC category candidates are required to deposit an application fee of Rs 500/-. DD to be taken in favor of Commissioner, AP Vaidya Vidhana Parishad, Gollapudi, Vijayawada Payable at Vijayawada. No application fee for SC/ST/PH category candidates. Applicants who have successfully applied within the stipulated time will be assessed on the basis of Academic Record , Work-Experience and/or Written Test based on syllabus as per the educational standards prescribed for each post. 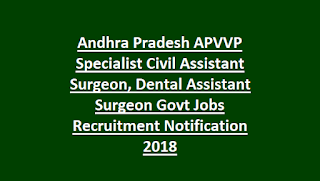 Candidates interested to join Medical Department under the desired post as per the eligibility must fill the application form and submit it to the APVVP before the closing date of 31-10-2018. 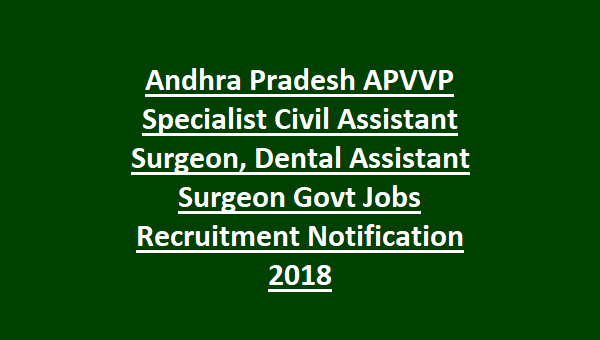 Candidates seeking possession under Medical department as Assistant Professor, Civil Assistant Surgeon, Dental Assistant Surgeon can refer the official notification.